Manx music and songs for folk instruments. First compiled by Colin Jerry in 1979. 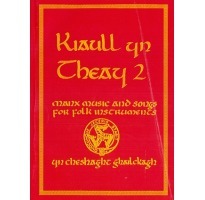 Kiaull yn Theay 1 & 2 are THE main sources for Manx traditional tunes (jigs, reels, slow airs) and songs in Manx Gaelic. Most material comes from the late 19th century collecting activites of W H Gill, Deemster Gill and Dr John Clague and A W Moore. Some tunes are from the early 20th century collecting of Mona Douglas and occasional tunes have been repaired but this is noted in each instance. Kiaull yn Theay 2 is A5 and contains around 110 items. Colour paperback cover, spiral bound.